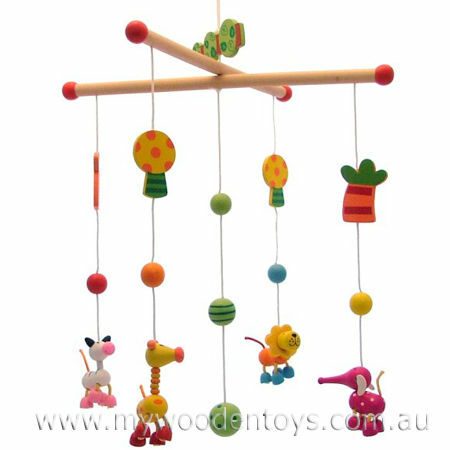 Wooden Wild Animals Mobile is a very sweet simple hanging mobile which is very well made. It has a Zebra, Lion, Elephant and Giraffe suspended from two wooden arms. The animals twist and twirl alongside trees and coloured balls. A very happy mobile with lovely cheeky characters the Lion even has a felt mane. Size: Animals are approx 5cm wide x 6cm tall. Mobile hangs 45cm top to bottom. We like this because: "Very sweet little mobile with lovely colours and happy characters."